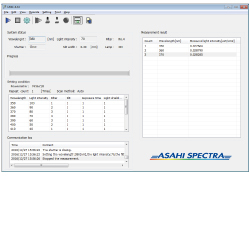 Software Download | Asahi Spectra USA Inc.
You can control our optical instruments from PC. A serial number and your company name are required to download software. Some of them are provided by CD-ROM only. *Both 32bit and 64bit are available. We support both English OS and Japanese OS. *You cannot use our software by a tablet PC.